What Every Girl Should Know - A Personal Relationship with Jesus! 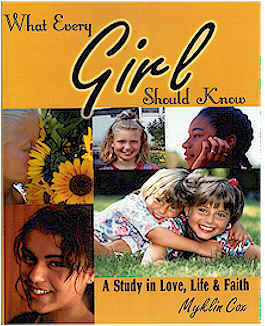 In What Every Girl Should Know: A Study In Love, Life, & Faith, the FIRST topic Myklin addresses is the most important thing every girl should know - having a personal relationship with her Lord and Savior, Jesus Christ! Clearly outlying the plan of salvation in this chapter, Myklin shares the questions in her heart and mind as a young girl concerning God and His purpose for her life. Girls will find answers to questions like, "Why did God create me?" and "How could someone like me be special in His eyes?" Each girl will learn how much the Lord loves her and desires to be a vital part of her life! Two Minutes Could Change Your Life Forever! Have you requested your FREE sample lesson from What Every Girl Should Know? Click here!